nancye's art and beautiful junk: Boy is it hot! Boy is it hot already. I really tried not to do the air but I cannot stand the humidity. I'll be in the house making more fairies and doing more classes...that is when I am awake. I scrubbed another floor today before radiation and I am about to take a nap. Just wanted to show you my new fairy. Hope you like her. Taking my nap now. 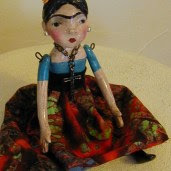 This is splendid, nancye.I love the way you show the elegance of facial features in your dolls. You are amazing! Your fairy is beautiful. You share your talent with the rest of us so generously. Thank you for making my jaw drop again. I continue to pray for your healing. You are loved. Nancye your fairy is darling! glad you are up to doing some more dolls. There is no point in being uncomfortable, so don't hesitate to turn on the air. Being in a cold country I am so grateful when the sunshine finally comes, so event though my house is quite warm these days, I refuse to put the air on, lol!